“Born in London in 1906, Eleanor Hibbert was the unusually reclusive “real person” behind three of the most popular pseudonymous authors of our time–Jean Plaidy, Victoria Holt, and Philippa Carr. The Identity of Victoria Hot was such a well-kept secret, for instance, that many readers assumed she was Daphne du Maurier. If Hibbert herself was little known, her work was well loved: she wrote some 200 books that have sold 100 million copies worldwide. 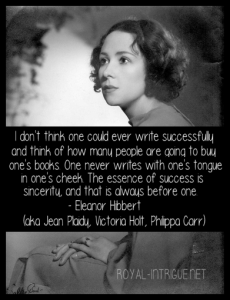 Hibbert began writing in her teens and in her early twenties married a man deeply supportive of her career. History was her first love, and her well-researched historical novels, published under the name Jean Plaidy, brought Hibbert her first devoted readers. In England, some of the Plaidy books became required reading in history classes. Best-seller status came in 1960 with Hibbert’s first romantic suspense novel, Mistress of Mellyn. An effort to recreate the atmosphere of Jane Eyre, it marked a new direction for the novelist, who signed the book Victoria Holt. Philippa Carr did not have her debut until 1972, with The Miracle at St. Bruno’s, in which Hibbert sought to mingle history and fiction in a new way, bu focusing on the life of a family caught up in famous historical events. Hibbert shunned publicity, dedicating most of her time to the writing she loved. She wrote in a penthouse overlooking Hyde Park in London. She also owned a thirteenth-century home, King’s Lodging, where both Henry VIII and Elizabeth I once were guests. Considering the success of her work, Hibbert’s lifestyle was modest, and she reportedly paid 98 percent of her income to the British government in taxes. “Due to illness, Jean Plaidy was unable to go to school regularly and so taught herself to read. Very early on she developed a passion for the ‘past’. After doing a shorthand and typing course, she spent a couple of years doing various jobs, including sorting gems in Hatton Garden and translating for foreigners in a City cafe. She began writing in earnest following marriage and now has a large number of historical novels to her name. Inspiration for her books is drawn from odd sources–a picture gallery, a line from a book, Shakespeare’s inconsistencies. She lives in London and loves music, second-hand book shops and ancient buildings.